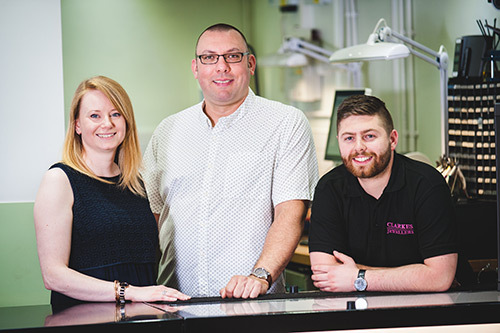 Clarkes are an independent jewellers in Sutton who have been serving the community and its surrounding areas, since 1996. We specialise in the design, alteration and repair of jewellery. Our on-site workshop are happy to undertake the small repairs of broken chains and other such items, right up to the full remodelling of treasured family heirloom pieces. Our friendly, approachable staff are experts in their field of knowledge, not only gained through many years of experience but also from studying at the likes of Holts Academy and GemA. They will guide you in the best possible course of action to achieve the outcome you desire. In recent years we have expanded the retail offering within the shop, and are now a destination retailer for prestigious brands such as; Sarah Ho, Dower and Hall, Bering watches, Le Cheminant watches, Hot Diamonds, Emozioni, Brown and Newirth, Trollbeads X along with our own lines of gold and platinum diamond jewellery. Here at Clarkes we champion British design and manufacturing. Clarkes prides itself on the old fashioned principles of good service and aims to excel in an age dominated by the ‘multiple’ retailers. Clarkes Jewellers Sutton are open Monday to Saturday until 9.30 am to 5.30pm.